The Teen Science Café at Morehead Planetarium & Science Center just completed its fourth year. We have two sister cafés—in Raleigh and Whiteville, NC—which began together as Open Minds Cafés (thanks to TSCN!). Morehead is located on the campus of the University of North Carolina in Chapel Hill, which is an excellent position for making connections with scientists and researchers. 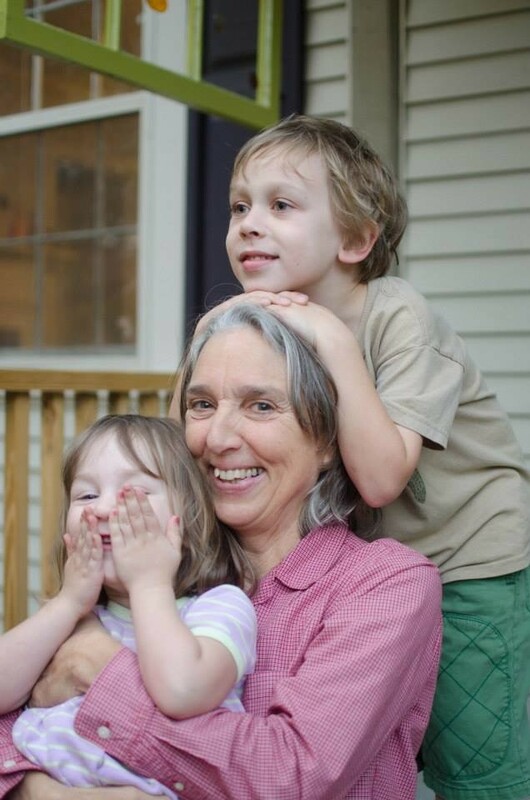 I’m an environmental educator (Certified in North Carolina!) and I have an undergraduate degree in Geological Sciences and a graduate degree in Science Education. Sixteen years ago I started working at Morehead Planetarium & Science Center (Space science! Kids!). Though I’ve mostly been involved with programs in the planetarium, I’ve also assisted with other programming in our summer camps and classrooms. Over the last five years I’ve helped coordinate the NC Statewide Star Party and, this year, the Carolinas Solar Eclipse Initiative. A couple of years ago I was asked to cover family leave for the person who was running the Teen Science Café—and several months later it was all mine! The transition was a bit of a surprise and it has taken me a while to get my feet on the ground. It was six months before I even knew about TSCN. 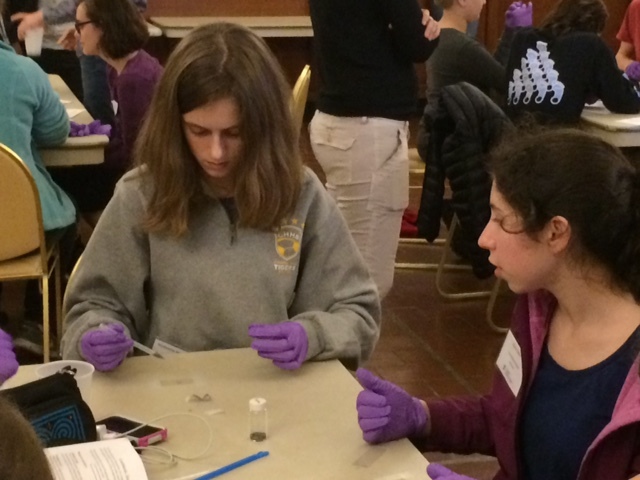 Teens explore the properties of graphene in a nanotechnology café. Morehead Planetarium is the 6th oldest planetarium in the U.S. and the first built on a university campus. We take our mission—to connect the University and the citizens of North Carolina in an improved understanding of science—seriously. Besides being a field trip destination, we have an afterschool program, summer science camps, and lots of outreach. Teen Science Cafés fit perfectly within that mission, connecting research scientists at UNC with community teenagers. The hardest part for me has been time. I wear many hats and Teen Science is neither the first nor the biggest, so keeping up with the details can be challenging. Most aspects of organization (finding the scientists, advertising, coordinating with the Advisory Board) have become easier, but I don’t yet feel that we are optimizing our impact—on teens or scientists. “Being in the moment: The science of meditation” In the age of Facebook, smart phones and iPads, it’s easy to get distracted! But did you know humans have been combating distraction for over 2,500 years with a particular technique? Mindfulness meditation, which involves focusing on the present moment, has been scientifically shown to improve well-being in many ways. In this Teen Science Café you’ll learn what meditation is, how to meditate (we’ll practice together), the psychology behind why it is helpful, and the scientific evidence for its benefits. 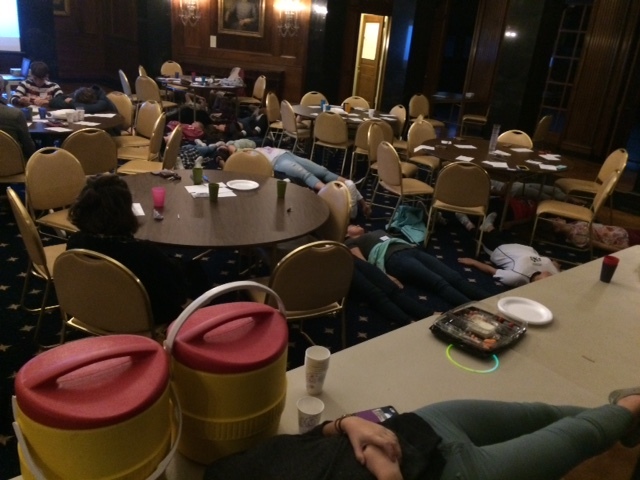 Students combatting distraction through meditation. The best thing about the program is the teens—especially the ones on the Advisory Board that I really get to know. They are smart, funny, busy with many things, and always ready to learn. They make me laugh, make me think, make me realize how fortunate I am to have them in my life. And speaking of smart—EVERY scientist who has spent time with the group has commented afterward on the quality of the teens’ questions, the curiosity they have for the subject, and the knowledge and interest they bring. They all seem to be pleasantly surprised by this. Look for partners – both in and outside your organization. I found three college undergrads to help me run the cafés. They are there to reflect with me on issues and be my eyes and ears. They also get to know the teens and connect with them. They often offer me advice on scientists and activities as well as inspiration for the important work we are doing.